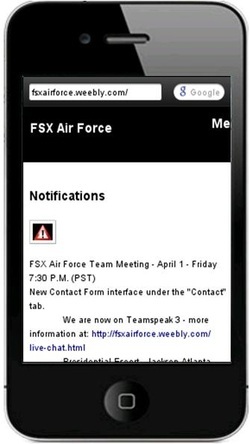 The FSX Air Force now has a new and neat interface for mobile devices to enable viewing and response more quickly. The mobile version of this website is interactive (according to the phone model) and has buttons that are quick to get to. Click on the menu (to the right) and it will lead you to all of the website's pages. Also, if you don't like the new mobile interface, scroll down to the bottom and click the label "Full Site." The team will keep making changes and maintain the website to make it more user-friendly, informative, and interactive.